We are a professional locksmith company providing commercial services around Reno we work closely with the fire department Marshal to meet your demands when it comes to state requirements and regulations. We expanded our commercial client base to schools, apartment complexes, offices, stores, and more! We constantly keep in our inventory the latest technology high security lock systems that will meet your commercial property needs. Keyless Entry Lock System – The top concern of most commercial property and business owners is keeping their investment safe and secure. In order to accomplish that, it is recommended to keep up with the latest technology security lock system options. Although there are some reliable standard high security lock systems that may do the job providing protection for your business, there are other security options that will not only increase the level of security for your business, but will also add convenient user experience. 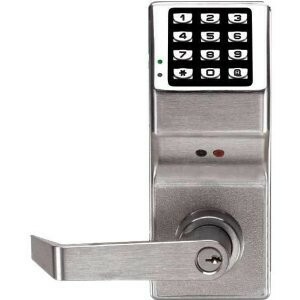 Electronic locks in the form of keyless entry lock system is a good example. In addition to the added security, the system does not require any use of keys which means no more calling a locksmith Reno to have a lock rekey when an employee leaves or lose the key. The system works on a unique pass-code method in order to gain access. It can contain up to 3000 users in its memory, so you can add and remove users from the system as you please! Exit Devices – Also known as Pushbars or Panicbars, these types of lock systems are mostly common to be found on emergency exit doors on commercial property and brick and mortar businesses. These types of bars allow fast access out in case of an emergency which are required by law to have for a commercial property business. Exit devices can usually be mated with many other types of lock systems such as electronic handles and keyless entry for example. Our team of commercial locksmith Reno technicians are fully trained and certified to work with many types of exit devices that are currently in the market. We do installation, maintenance and repair.